Today we are joined by Cindy Wilkins. She’s a girl we understand…busy. Do you find yourself there? Busy and perhaps depleted. Cindy leads us to our source of renewal, we pray you are filled! The countdown leading to the end of school usually began for me in mid-May. There was something reassuring about those tiny numbers I’d write in the corner of each day’s lesson plan. They somehow made it seem possible to persevere, even on those days when I didn’t think I could. Despite my doubts, each year textbooks were counted and put away, final grades got added to report cards, walls carefully stripped of their decorations, and with a last glance over my shoulder, I’d drag myself out the door, hoping to make it to my car. We all get there. Life is busy, complicated and stressful! Whether it’s parenting, our careers, caring for someone, an illness, or a million other things; our souls can feel drained and parched as if a drought has left them shriveled up. What we desperately desire at this point is a vacation! A chance for respite to rest, recharge, and renew. Each year, summer break dangled that chance in front of me, but somehow, despite several weeks off and an annual trip to the sea, time always flew by. The days just never seemed quite long enough to restore my depleted soul. Looking back, I now realize it wasn’t the length of my vacation that left me still feeling withered; it was the depth. I sought replenishment in a slower schedule of sleeping in, lingering, and doing less; when instead, I should have been seeking to be restored by spending more time with God delving into His Word. These days, when I get the urge to pack my bags or my thoughts drift off in search of a place of revival, I’m learning to stop and remind myself where it is I need to be planted. Vacations are wonderful, but they’re only temporary. 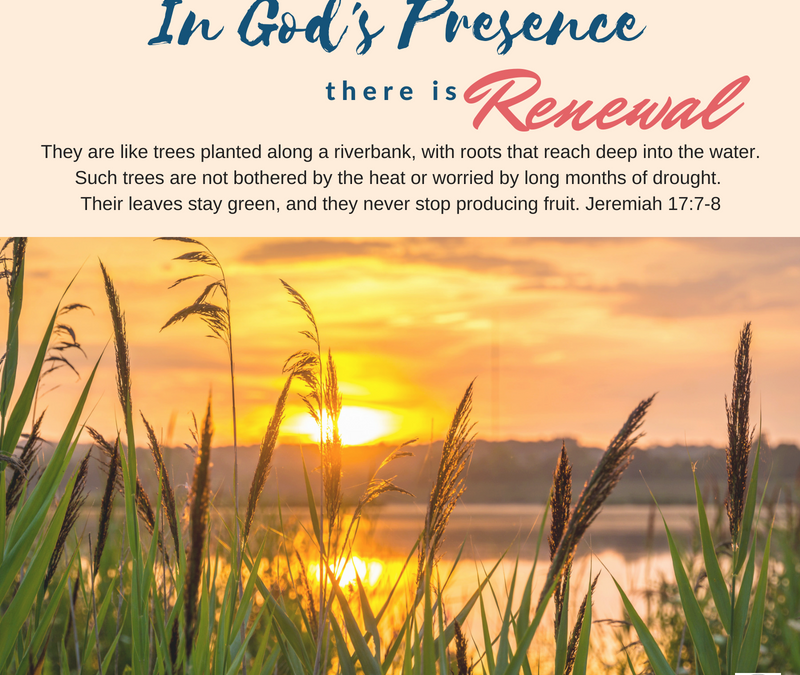 Living day to day in God’s presence, deeply rooted in the hope of Jesus: the Living Water, helps us not only thrive in the midst of real life but offers life eternal: where vacations will never be needed and our souls are forever renewed! Lord, We come admitting that we let the world overwhelm us and deplete us. Forgive us. You offer all that we need in your presence. You offer rest, refreshment, and daily renewal. Help us grasp all of You with arms wide open. Thank you for your fresh blessings every day. Amen. Read Psalm 23. As you read insert your name every time the word “I” appears. Thank God for all that He offers. How often are God’s mercies offered afresh? What difference does Jesus note between the water the Samaritan water would draw from the well and the water He offers her? Join us tomorrow as we discover there is grace in the presence of God. Great post, Cindy! It is easy to look to other things to refresh and renew us instead of remembering that what we’re seeking can only truly be found in God. I love those verses from Jeremiah- such a great image of how God can sustain us even in times of challenge. I”m afraid I spent a lot of years trying to fill myself back up on my own. I still catch myself doing it sometimes! I remind myself that I need a change of focus! It makes all the difference! Amen! There is no sweeter or more refreshing place to be than in His presence. Loved this post. Thank you Bunny! 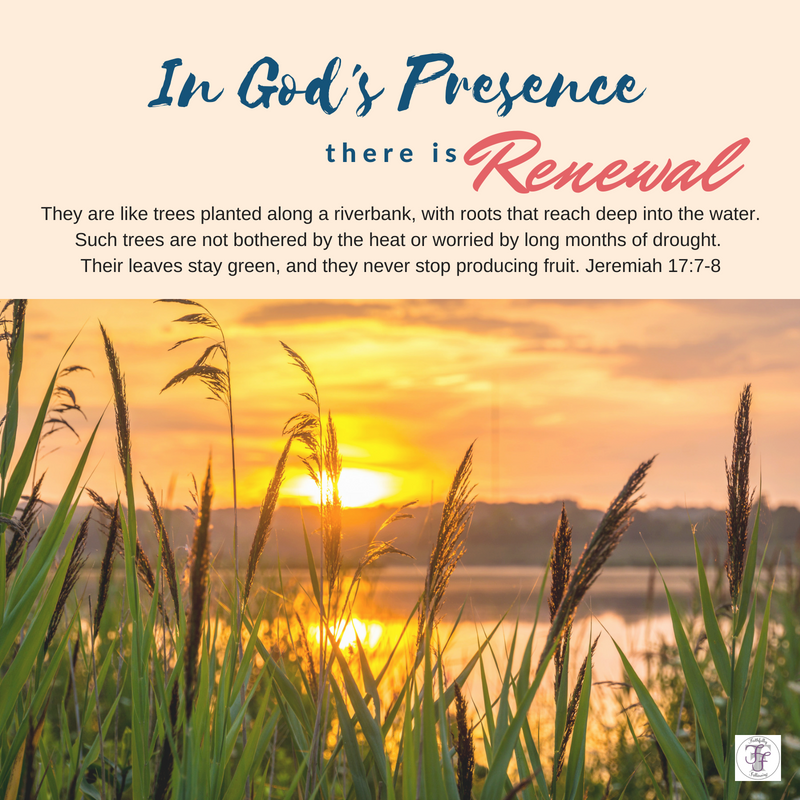 I’m not sure why we sometimes try everything else first when we know that you are right….there’s no place more refreshing than to be in His presence! It never ceases to amaze me how God brings things together! I should be packing right now for our annual trip to Oak Island, NC: one of my favorite places! Instead, I am glued to the Weather Channel watching and waiting to see what Florence will do there.. Oak Island is where I feel whole and refreshed. It is the place I talk of in this post that I depended on for 20 plus years to feel renewed by. And here we are today and as I read I’m reminding myself that it isn’t a place or a time or a break from routine that renews me; it is being in God’s presence and I can be with Him sitting here at my dining room table, while I’m doing laundry, or even in the midst of a terrible storm. God. Is. Good.